The hardy but delicate pansy is one of the earliest flowering plants, in spring . Its ancestor, the Viola tricolor, is growing wild on European grain-fields. Viola tricolor hybridized with other viola species gave us the large-flowered garden plant, with velvety petals, referred to as Viola × wittrockiana. "Perhaps no flower (not excepting even the queenly rose) claims to be so universal a favorite, as the viola tricolor; none currently has been honored with so rich a variety of names, at once expressive of grace, delicacy and tenderness." Due to the shape of the petals, in particular its resemblance to the human face, the pansy is often associated with deep contemplation, hence its name; "pansy" comes from the French word pensée meaning "thought". The smaller, usually purple, wild pansy is also known as Johnny-jump-up, heartsease, and love-in-idleness. 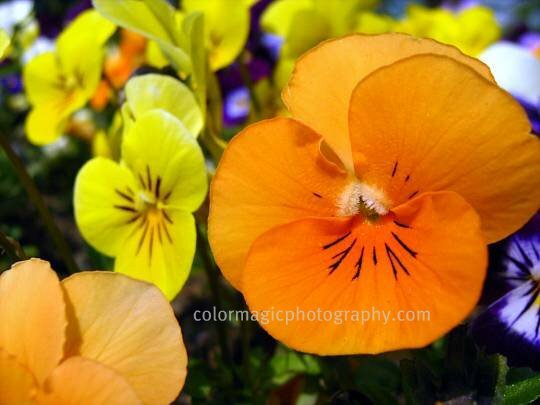 The pansies in the photo have a single color and black lines radiating from the flower center similar to viola markings. Pansies are winter hardy, they can survive light frost and short periods of snow cover (see the link). In warmer climates pansies can even bloom over the winter. Well, this is not a marking, just a small visitor with markings on its legs. The little guy is a perfect match in color for this pansy. 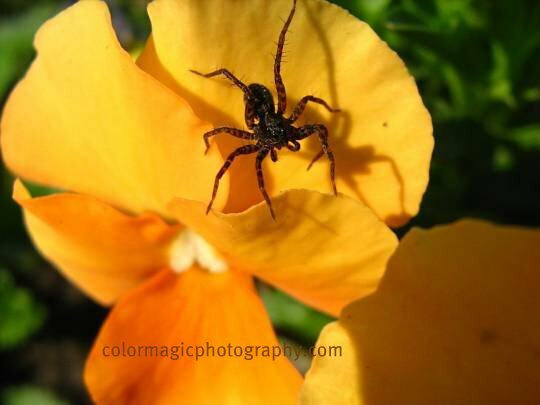 Vibrant colour and a very good capture of the spider and his shadow. Gorgeous, great capture. The color is stunning.